– There will be no youth finals will be swum, also the junior titles at 800 and 1500 freestyle not. These are / were included in the NJJK. 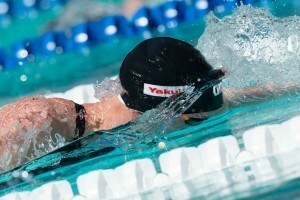 – There are B-finals on the program, as well as 100 and 200 free C-finals. – B-finals are only visible for Dutch. 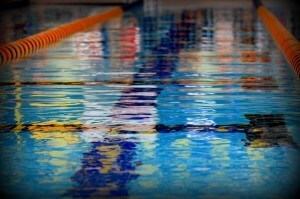 – 200 free B-finals open, and the C-finals only to Dutch. – At 100 free is talk of semi-finals (open), and C-finals (for Dutch only). – On the 50 meter distances semifinals (open) and there are no B- or C-finals. Watch the championship final race videos from the final day of the Eindhoven Swim Cup. Watch here for a recap of tonight’s action at Dutch Olympic Trials. Watch as Kromowidjojo, Heemskerk, Ottesen, Pedersen, Steenbergen and more take on day 4 of the Dutch Olympic Trials. Sebas van Lith and Maaike de Ward set a championship record apiece at this morning’s Eindhoven Swim Cup prelims. The highlight for the women tonight came in form of the 200 m freestyle race where Dutch native Femke Heemskerk touched in 1:55,85; she is now ranked 7th in the 2016 World Rankings. The women of the Netherlands could go from not even entering a 4×200 free relay at the 2015 FINA World Championships to contending for a medal at the 2016 Rio Olympic Games. Tonight, many of the top athletes from the Netherlands, Belgium, Serbia, Germany, and Denmark, among other nations, will converge to compete in the first finals session of the Eindhoven Swim Cup. The 50 free will be the only individual final of the night, the last event of the session, with time for the athletes to recover from the event semifinals, which will lead off the night. Leading the way for the women after the heats this morning is reigning Olympic sprint champion Ranomi Kromowidjojo, who moved up to number six in the world with her 24.67 in the heats this morning. Jesse Puts of the Netherlands and Renzo Tjon A Joe of Suriname will lead the two semifinals of the men’s 50 free, after going 22.37 and 22.40 in the heats, respectively. Hungary’s Evelyn Verraszto leads the 100 fly semifinals with 1:00.10. Kira Toussaint of the Netherlands and the University of Tennessee comes into the women’s 100 back semifinals with the fastest time, after taking down the meet record this morning with 1:00.51. We will denote FINA ‘A’ standard swims with an asterisk (*). Martin Brzoskowski took the win in the men’s 400 free, with Jacob Heidtmann close on his tail in 4:49.25. Both clocked FINA ‘A’ cuts, swimming in under the 3:50.40 standard. Those times place them 14th and 22nd in the world rankings. Germany’s Poul Zellmann grabbed third in 3:50.70, with Serbia’s Velimir Stjepanovic taking fourth in 3:52.90, Lorenz Weir Mans fifth in 3:58.24, Pholien Systermans sixth in 4:03.25, Irakli Revishvili seventh in 4:03.44, and Geoffrey Butler rounding out the championship final in 4:03.77. Kyle Stolk of the Republic of South Africa took the big win in the men’s 200 IM in 2:01.48, followed by Pavel Janecek in 2:01.83 and Sebas van Lith in 2:02.80. The trio were well ahead of the field. Arjan Knipping took fourth with 2:05.10, and Frank Roovers also hit a 2:05, swimming 2:05.77. Floris Kotterink swam the event in 2:07.96, with Jelle Betten (2:09.36) and Jacob de Roos (2:10.97) rounding out the field. No swimmers hit the FINA ‘A’ cut of 2:00.28. Current world record holder Rikke Moller Pedersen blasted a huge swim in the 200 breast, clocking 2:22.83 to move up to fourth in the world rankings, within three seconds of first-ranked Rie Kaneto. She absolutely destroyed the FINA ‘A’ Olympic standard, 2:26.94, and came in a mind-blowing seven seconds ahead of the competition. Second went to Hong Kong’s Yvette Man-Yi Kong in 2:29.88, followed by Michelle Lambert in 2:30.09. Annette Elzerman took fourth in 2:32.11, with Jolien Vermeylen (2:33.37), Sandra Swierczewaska (2:35.73), Tex Schouten (2:37.64), and Ilse Rijnja (2:39.10) rounding out the final. Ruben van Leeuwen took the top spot in the final of the men’s 200 fly in 2:02.58. Silver went to Teimuraz Kobakhidze in 2:03.90, and bronze was Ensger Kotterink in 2:04.14. Martin Zikmund took fourth in 2:05.71. There was a tie for fifth place between Fabian Beimin and Akaky Vashakydze at 2:06.10. Philip Lucker (2:06.54) and Llewellyn Little (2:07.07) rounded out the championship final. After putting up the third-fastest time in the heats this morning, Thom de Boer of the Netherlands will be tonight’s top qualifier in the men’s 50 free, after swimming a 22.42, still not quite fast enough to crack the world rankings. The top eight were separated by only .35 seconds, and in the second slot was Renzo Tjon A Joe of Suriname, cutting .o3 from his swim this morning with 22.47. Jesse Puts of the Netherlands and Geoffrey Cheah of Hong Kong and Club Wolverine tied for the third slot in tonight’s final with 22.54. Also in tonight’s final will be Damian Wier Ling, George Bovell, Are Schwietert, and Glenn Surgeloose. No swimmers made it in under the FINA ‘A’ standard 22.27. If this morning’s 24.67 was quick for reigning Olympic champion Ranomi Kromowidjojo (hint: it was), then her semi-final swim tonight was on fire. This morning, she dropped .06 from her season-best time from February’s Hague Grand Prix, and tonight, she took down another .28 seconds, posting 24.39. She now sits fifth in the world rankings, moving up six slots in a single day. In the final later tonight, if she can drop another .27 seconds, she’ll unseat reigning #1 rank Cate Campbell. Half a second back was Tamara van Vliet, also of the Netherlands in 24.90, and Germany’s Dorothea Brandt will be the third seed tonight, after swimming 24.97. Vliet moves into the rankings at 17th, and Brandt didn’t quite hit her season-best 24.80 (ranked 14th). Kim Busch, Maud van der Meer, Birgit Koschischek, Nelly Velthuijs, and Ilse Kraaijeveld will also swim tonight’s ‘A’ final. The top five swimmers hit the FINA ‘A’ standard of 25.28. Although only two relays competed in the women’s 800 free relay tonight, both made up of Dutch national teamers, it’s worth noting that 16-year-old Marrit Steenbergen set a new Dutch national youth record in her lead-off 200 free split, a 1:57.95*. That time is good for 20th in the world rankings, and it comes in under the FINA ‘A’ standard 1:58.96. She teamed up with Esmee Vermeulen, Robin Neumann, and Femke Heemskerk for a 7:52.06. Heemskerk also clocked a quick split, a flying start 1:56.06. 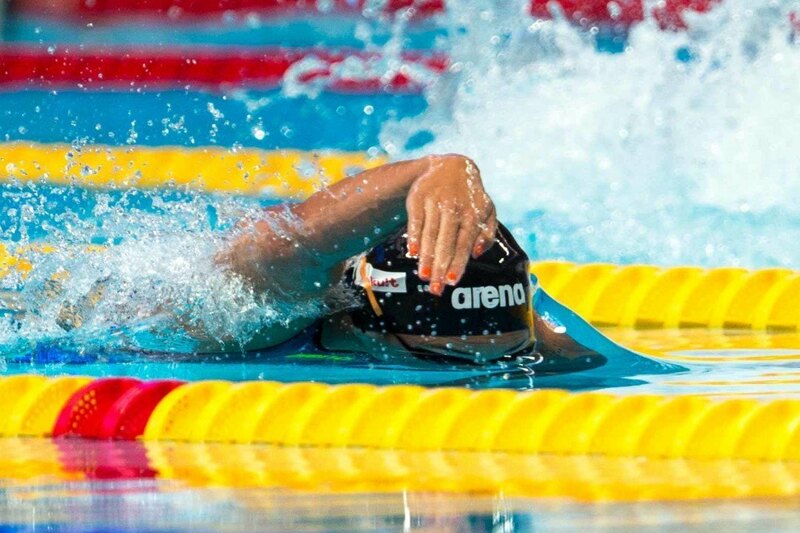 She currently sits eighth in the world rankings with a flat-start 1:56.16 from the Amsterdam Swim Cup in December. Evelyn Verraszto of Hungary will be tonight’s top seed in the women’s 100 fly, after clocking 59.77 in semifinals, dropping .33 from her time this morning. She was the only swimmer under a minute. The field is tightly packed for the third, fourth, fifth, and sixth seeds, with Julia Mrozinski in 1:00.40, Lisa Hopink in 1:00.51, Kinge Zandriga in 1:00.59, and Kimberly Buys in 1:00.68. Paulina Schmiedel sits in teh sixth slot with 1:00.92. The live results have Oktay Veldhuijs listed seventh with a time that is obviously an error, and Elinore de Jong slides into the final ‘A’ slot with 1:02.53. No swimmers made it in under the FINA ‘A’ standard 58.74. Maaike de Waard and Tessa Vermeulen both swim 1:01s, with 1:01.29 and 1:01.95, respectively. Esmee Bos, Marieke Tienstra, Jenny Mensing, LouLou Janssen, and Jade Smits will round out the ‘A’ final. Suriname’s Renzo Tjon A Joe took the win in a tight championship final of the men’s 50 free, improving yet again from his earlier swim, this time going .14 faster. 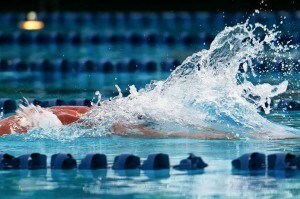 However, his time wasn’t quite enough to hit the FINA ‘A’ standard of 22.27. Damian Wier Ling also saw improvement from his swim earlier tonight, dropping .15 for a second-place 22.43. Thom de Boer fell from his first seed to nab the bronze in 22.47. George Bovell was very close behind to miss the podium in 22.49, followed by Glenn Surgeloose in 22.52, Geoffrey Cheah in 22.58, Jesse Puts in 22.59, and Are Schwietert in 22.78. Ranomi Kromowidjojo did it again, cutting even more time to settle into the fourth slot in the world rankings. In three swims over the course of one day, she has bypassed the likes of Abbey Weitzeil, Melanie Wright, Madison Kennedy, Etiene Medeiros, Aliaksandra Herasimenia, Anna Santamans, and Bronte Campbell’s best swims of the season. Dorothea Brandt took the silver in 24.84, dropping .15 from her swim earlier tonight, and Tamara van Vliet grabbed bronze with 24.87. All three medalists swam the FINA ‘A’ cut of 25.28, and so did fourth-place Kim Busch, who finished in 25.25. Maud van der Meer finished fifth in 25.51, a little slower than her ‘A’ cut swim earlier tonight. Birgit Koschischek and Nelly Vlethuijs tied for sixth in 25.76, and Ilse Kraaijeveld rounded out the field in 26.02. 800 free relay was a time trial to swim one of the four fastest time of 2016 to qualify for Rio. No special event or national title to be earned for club teams. Thats why no other team participated. Great time from Steenbergen on de 200 free, but Kneppers also suprised with the time. Could have been on team one and if she does this one more time in the individual 200 freestyle, she makes a good chance on getting on the Rio squad.